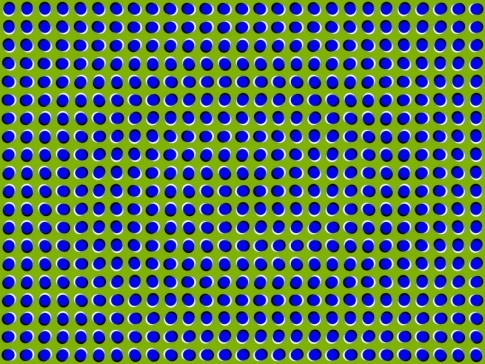 This headache inducing illusion is simply a static image of a green background with a series of blue dots, however when you look at it the whole thing appears to move and warp in a wave-like fashion. Weird. Like a fat slug moving around below a gaudy blanket! what the hell is wrong with this damn pic?! Hahahahah........ lol my friend walked down sairs when i was looking at this, i looked like a nerd cuz i was moving my head so the dots would move........lol but this is so messed up!!!!!! its like its coming out the screen and waving and going back in. The black and white bands create the illusion of shadow, or depth, as your brain interprets it. The depth is impossible because the shadowed object, in this case, the bright colors, forms a circle. Your brain tries to explain the apparent depth of a flat circle by assuming it's moving.